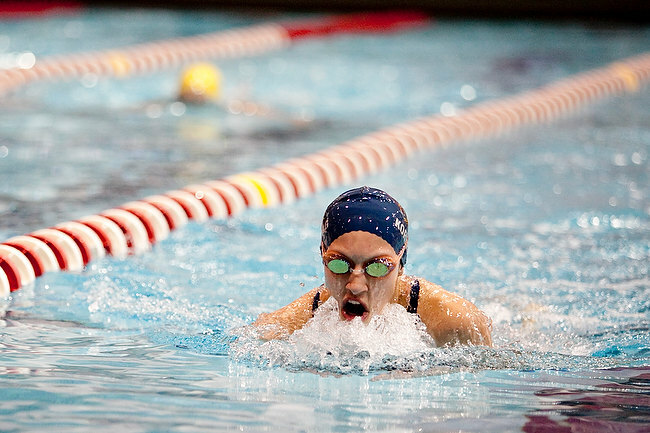 Continuing with this latest theme of high school sports championships, I wrapped up my weekend for the Herald with the MIAA Division 1 Swim Dive Championships over at Harvard’s Blodgett Pool. 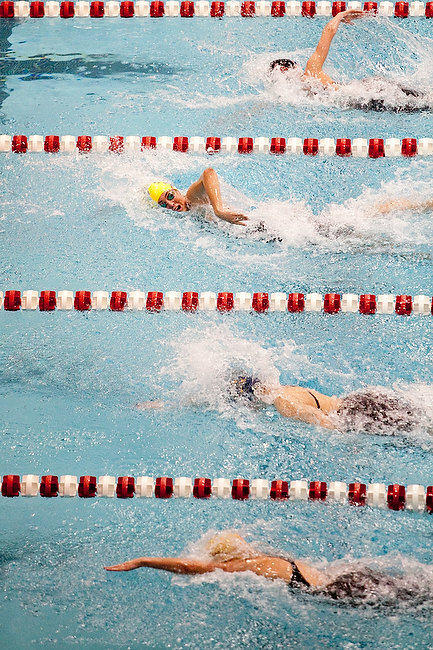 It was loud, hot and humid in there, so there were plenty of enthusiastic teammates on the deck to liven up the otherwise solitary scenes of lone swimmers in the water. I had a full slate of assignments ahead of me for the Herald, so unfortunately, I didn’t get a chance to stick around for any of the championship rounds. From what it sounded like in that confined space for the preliminary rounds, I’m sure it was crazy! 11.21.2010 — BOSTON — New Bedford teammates cheer on Sara Rivard in the 100 Yard Butterfly at Harvard's Blodgett Pool in the MIAA Division I Swim and Dive Championships on Nov. 21, 2010. 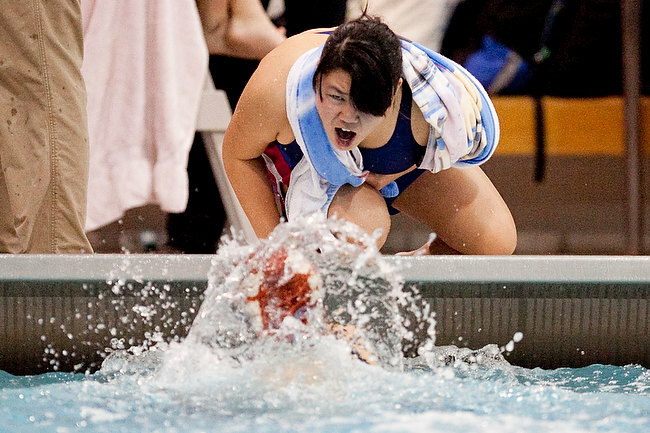 11.21.2010 — BOSTON — Acton-Boxborough's Zoe Judd begins to open up a lead during the 100 Yard Freestyle at Harvard's Blodgett Pool in the MIAA Division I Swim and Dive Championships on Nov. 21, 2010. 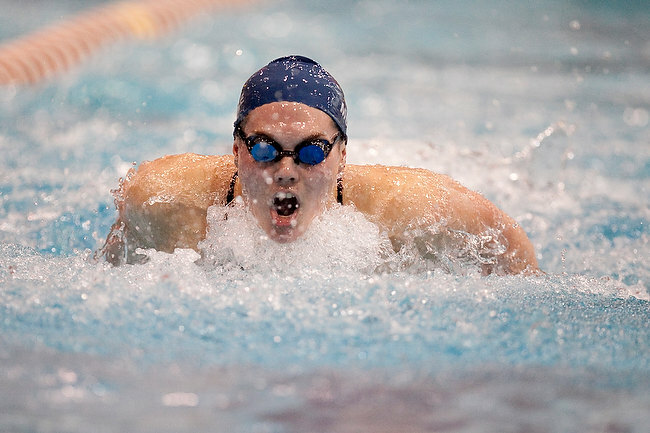 11.21.2010 — BOSTON — Andover's Rachel Moore competes in the 100 Yard Butterfly with a state record-setting performance at Harvard's Blodgett Pool in the MIAA Division I Swim and Dive Championships on Nov. 21, 2010. 11.21.2010 — BOSTON — A teammate cheers on Brookline's Nan Wang in the 100 Yard butterfly at Harvard's Blodgett Pool in the MIAA Division I Swim and Dive Championships on Nov. 21, 2010. 11.21.2010 — BOSTON — Andover's Ashlee Korsberg opens up a lead in the 200 Yard IM at Harvard's Blodgett Pool in the MIAA Division I Swim and Dive Championships on Nov. 21, 2010. So it’s high school sports championship season — usually a time of year when I get to shoot a lot of sports for the Boston Herald. And it happens three times a year! This installment of championship action comes from the state soccer finals in Worcester, where I had two games — D2 and D3 — on the docket. Here’s a little rundown from Saturday’s games. 11.20.2010 — WORCESTER, Mass. 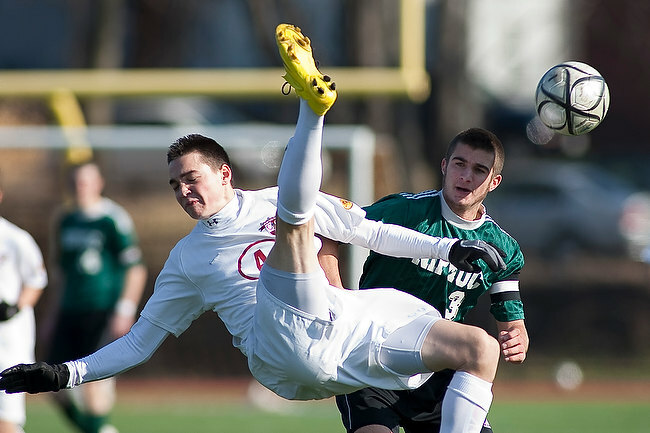 — Concord-Carlisle defender Bennet Simonton tries for a bicycle kick with his back to Nipmuc midfielder Kelly Rooney in the MIAA Boys Soccer Division 2 Championship on Nov. 20, 2010. Concord-Carlisle won, 2-1. 11.20.2010 — WORCESTER, Mass. 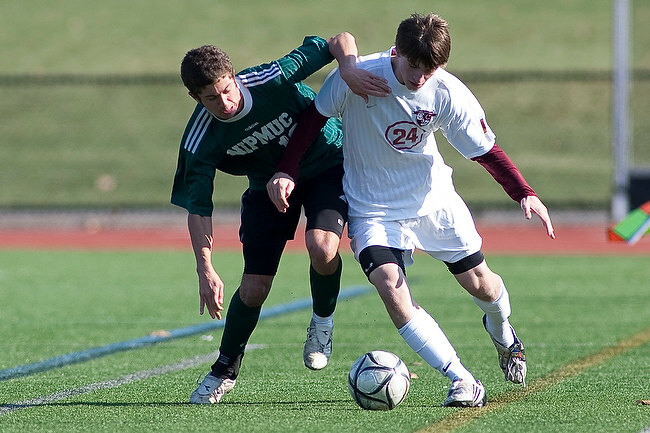 — Concord-Carlisle midfielder Zach Bloom shields Nipmuc midfielder Peter Clark in the MIAA Boys Soccer Division 2 Championship on Nov. 20, 2010. Concord-Carlisle won, 2-1. 11.20.2010 — WORCESTER, Mass. 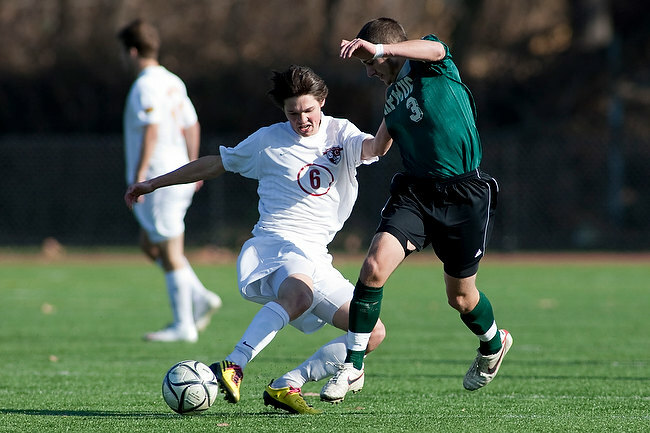 — Concord-Carlisle defender Stowe Simonton steals a loose ball against Nipmuc midfielder Kelly Rooney in the MIAA Boys Soccer Division 2 Championship on Nov. 20, 2010. Concord-Carlisle won, 2-1. 11.20.2010 — WORCESTER, Mass. 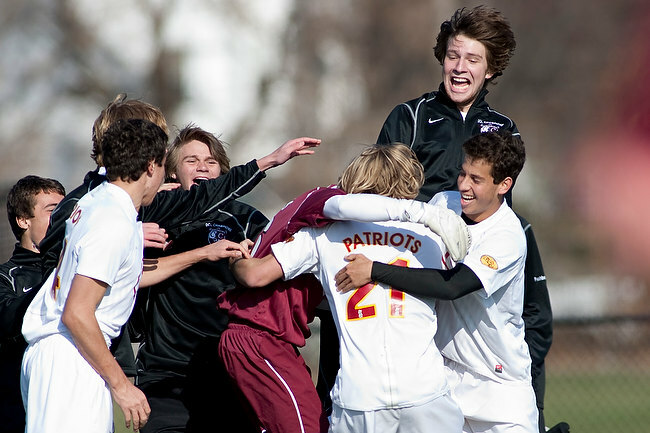 — Concord-Carlisle's bench rushes the field after beating Nipmuc, 2-1, to win the MIAA Boys Soccer Division 2 Championship on Nov. 20, 2010. 11.20.2010 — WORCESTER, Mass. 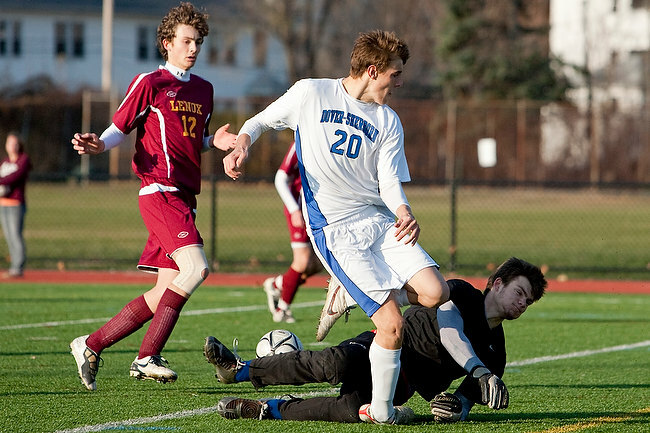 — Lenox goalkeeper Andrew Bravo stuffs a shot attempt from Dover-Sherborn forward Sam Jordan in the MIAA Boys Soccer Division 3 Championship on Nov. 20, 2010. Dover-Sherborn won, 2-0. 11.20.2010 — WORCESTER, Mass. 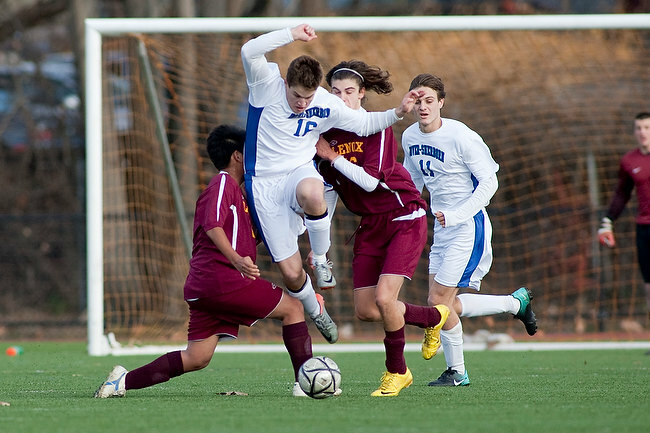 — Dover-Sherborn defender Chris Crowley gets caught up in traffic against Lenox in the MIAA Boys Soccer Division 3 Championship on Nov. 20, 2010. Dover-Sherborn won, 2-0. 11.20.2010 — WORCESTER, Mass. — Dover-Sherborn forward Cam Bielski gestures to the crowd after assisting on the second goal against Lenox in the MIAA Boys Soccer Division 3 Championship on Nov. 20, 2010. Dover-Sherborn won, 2-0. 11.20.2010 — WORCESTER, Mass. 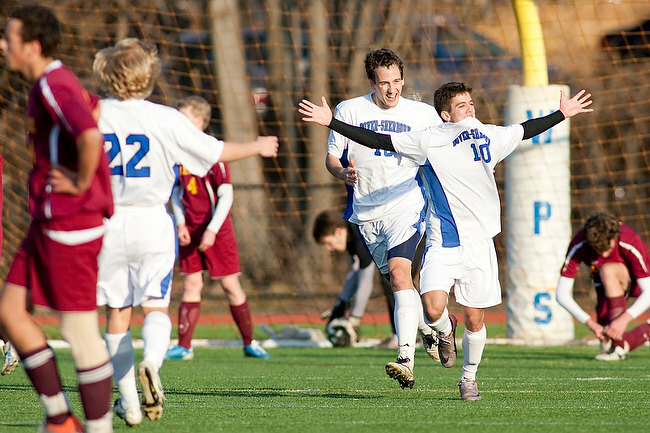 — Dover-Sherborn forward Cam Bielski is mobbed by teammates after beating Lenox, 2-1, to win the MIAA Boys Soccer Division 3 Championship on Nov. 20, 2010. 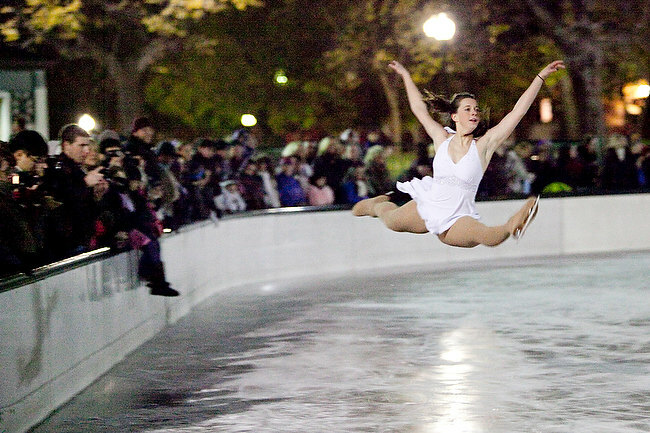 It’s a sure sign that winter is arriving when ice skating arrives at the Frog Pond on Boston Common. 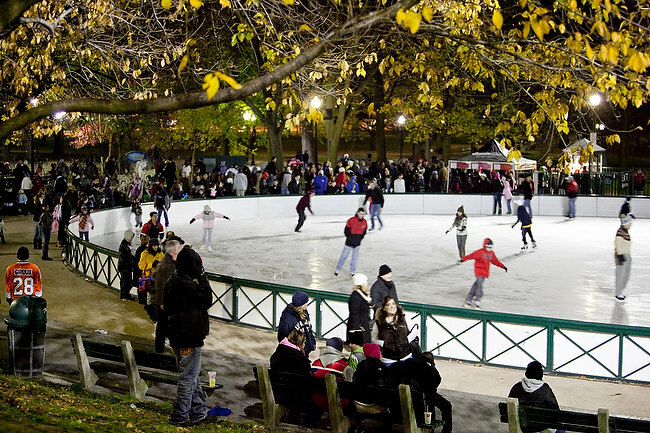 Since 1997, skating on the Frog Pond has been one of the signature attractions to Boston Common. And luckily for everyone involved, Mother Nature kept the temperatures frigid for the rink’s opening celebration last night. Here’s a few from a very cold, very dark night at the Frog Pond. 11.21.2010 — BOSTON — Skaters take advantage of the complimentary skating at the opening night of the Boston Common Frog Pond skating rink on Nov. 21, 2010. 11.21.2010 — BOSTON — Former Olympian Emily Hughes performs for spectators during the opening program for the Frog Pond on Nov. 21, 2010. The program featured former Olympians and Olympic hopefuls, as well as complimentary free skate. 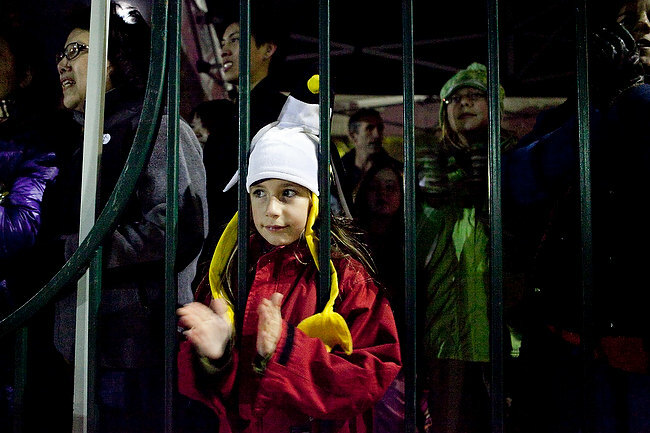 11.21.2010 — BOSTON — Kate Bariss, 9, of Brookline applauds for performers during the opening night of the Frog Pond on Nov. 21, 2010. 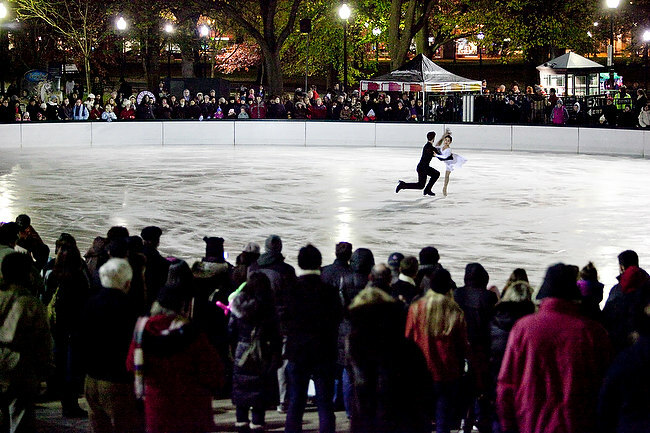 11.21.2010 — BOSTON — Ice dancers perform for spectators at the opening of the Frog Pond on Nov. 21, 2010. The program featured former Olympians and Olympic hopefuls, as well as complimentary free skate.